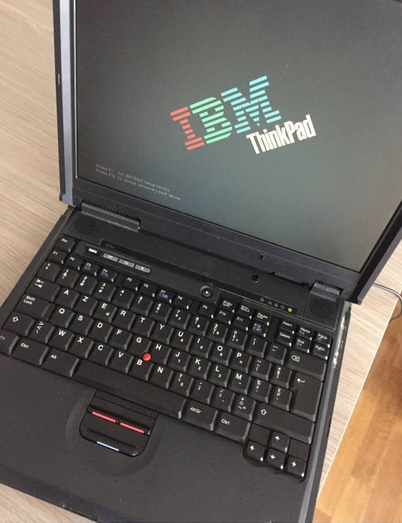 Hi all, anyone an idea which Thinkpad model this is? It's an IBM machine which runs windows 98. I only have this small picture and no physical access to the machine. Something from the A2x series. 14" by the looks of it, so not a A21p/A22p. The name on the left side of the LED strip is not readable, but I think it has an 'm' on the end, so A20m, A21m or A22m. What kind of model was this at the time? Budget laptop or more business orientated? Mainstream / workstation (outside of the A21e/A22e which was more 'budget'). Looks like A21m to me, if I blow up the image and run wavelet enhancements on the model number. That would fit right between T2x and T4x. Guessing from that model having a late P3 and two P4M's, I'd guess she would run pretty darn hot!